The tangy bean salad contains fiber and protein, which contribute to energy and stamina. Photo from Whole Foods Market. ARE they fruits or vegetables? Do they taste good? Where do I buy them? C’mon NYC Healthy Chick, what are GOMBS? Actually, “GOMBBS” is an acronym you can use to remember the most nutrient-dense, health-promoting foods on the planet. Joel Fuhrman, a medical doctor and author promotes this catchy acronym in his new book, “Super Immunity: The Essential Nutrition Guide for Boosting Your Body's Defenses to Live Longer, Stronger, and Disease Free." These foods should make up a significant portion of the diet, and JF recommends eating them every day. GOMBBS are extremely effective at preventing chronic disease as well as promoting health and longevity. OK, so what exactly are GOMBBS? Simply, they are Greens, Onions, Mushrooms, Berries, Beans and Seeds/Nuts. In his popular book, Joel Fuhrman offers several remedies for good health, including high consumption of GOMBBS. Photo courtesy of HarpersCollins Publishers. GOMBBS make up JF’s “Nutritarian Pyramid.” “A nutritarian,” he asserts, “is a person who strives for more micronutrients per calorie in their diet-style. A nutritarian understands that food has powerful disease-protecting and therapeutic effects and seeks to consume a broad array of micronutrients via their food choices. It is not sufficient to merely avoid fats, consume foods with a low glycemic index, lower the intake of animal products, or eat a diet of mostly raw foods. G – Greens. Want to protect blood vessels, reduce the risk of diabetes, plus have an excellent weight-loss tool? Eat unlimited quantities of greens. They contain about 100 calories per pound and are packed with the most nutrient-dense food missing from the U.S. diet. The majority of calories in green vegetables, including leafy greens, come from protein. This plant protein is packaged with beneficial phytochemicals, folate, calcium and contains small amounts of omega-3 fatty acids. Leafy greens are also rich in antioxidant pigments called carotenoids. The pigments are known to promote healthy vision. Greens have combined additive effects, working synergistically to remove carcinogens, reduce inflammation, neutralize oxidative stress and inhibit angiogenesis (the process by which tumors acquire a blood supply). Further, they have been shown to kill cancer cells, too. 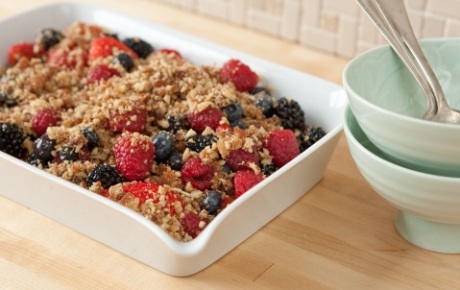 The berry crisp is a guilt-free dessert. Photo from Whole Foods Market. O – Onions. Great benefits come to those who eat onions, leeks, garlic, shallots and scallions. Experience improved cardiovascular and immune systems while increasing anti-diabetic properties. It also lowered the risk of gastric, prostate and colon cancers. Onions and friends detoxify carcinogens, halt cancer cell growth and block angiogenesis. Plus, they contain high concentrations of health-promoting flavonoid antioxidants. Flavonoids also have anti-inflammatory effects that may contribute to cancer prevention. Who knew flavonoids were so powerful? M - Mushrooms. White, cremini, portobello, oyster, shiitake, maitake and reishi mushrooms have all been associated with decreased risk of breast, stomach and colorectal cancers. Some are anti-inflammatory. They stimulate the immune system and prevent DNA damage. Mushrooms also contain aromatase inhibitors – compounds that can block the production of estrogen. These compounds are thought to be largely responsible for aiding in the prevention of breast cancer. B – Berries. Low in sugar, not to mention the fact that they are naturally sweet and juicy, blueberries, strawberries and blackberries are true super foods. Their vibrant colors indicate that they are chock full of antioxidants, including flavonoids and antioxidant vitamins. Berries are some of the highest antioxidant foods in existence. Berries contain all-important, disease-fighting antioxidants. Photo from Whole Foods Market. 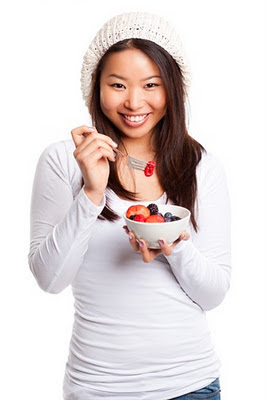 Berries are also awesome for cardioprotective and anti-cancer effects, such as reducing blood pressure and inflammation. And they can prevent DNA damage, inhibit tumor angiogenesis and stimulate the body’s own antioxidant enzymes. Consuming berries is also linked to reducing the risk of diabetes, cancers and cognitive decline. Want a better brain? Berries improve both motor coordination and memory. B – Beans. Beans and legumes are powerhouses of superior nutrition and the most nutrient-dense carbohydrate source. They are great for preventing diabetes and weight-loss because they are digested slowly, having a stabilizing effect on blood sugar while promoting satiety. Beans help to prevent food cravings, too. The soluble fiber found in beans and legumes lowers cholesterol levels. Fiber and resistant starch reduce the total number of calories absorbed from beans. Another benefit is that they are fermented by intestinal bacteria into fatty acids that help prevent colon cancer. Eat beans, peas or lentils at least twice a week to decrease colon cancer risk by 50 percent. They also provide significant protection against oral, larynx, pharynx, stomach and kidney cancers. S – Seeds. Don’t fret about the healthy fats in seeds and nuts. They aid in the absorption of nutrients when eaten with vegetables. Seeds and nuts contain healthy fats and are rich in a spectrum of micronutrients, including phytosterols, minerals and antioxidants. Consuming nuts helps with weight maintenance and diabetes prevention. Bok choy and carrots deliver on color, flavor and nutrients. Photo from Whole Foods Market. The nutritional profile of seeds is similar to nuts as it regards healthy fats, minerals and antioxidants. Seeds, though, are also abundant in trace minerals and higher in protein than nuts. Flax, chia and hemp seeds are extremely rich sources of omega-3 fats. Ready – Set – GOMBBS!!!! 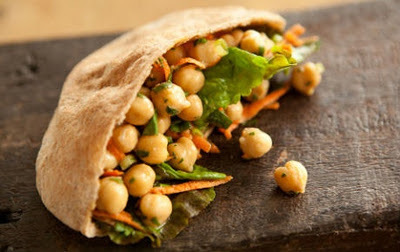 Try out some of NYC Healthy Chick’s favorite GOMBBS meals. They are full of flavor and variety, plus they are easy to prepare. 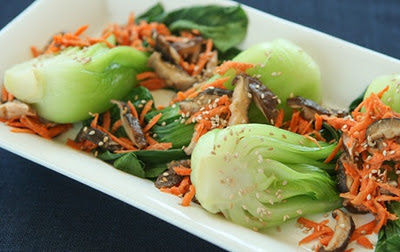 This colorful trio of greens, mushrooms and seeds are a light fare to be enjoyed anytime - Bok Choy with Carrots (http://www.wholefoodsmarket.com/recipes/2859) ... Spice things up with your beans by skipping the pita (or not)! Instead, serve a tangy beans and onion medley (Tangy Bean Salad) over your choice of healthy raw leafy greens instead. (http://www.wholefoodsmarket.com/recipes/531) ... Want a sweet treat that will boost brainpower and control weight? A no cook, no fuss version of Raw Berry Crisp (http://www.wholefoodsmarket.com/recipes/2689) is one great way to have it all in one dish. Thinking of becoming a nutritarian? Then pile on the GOMBBS! Disease Free" for as little as $14. This is the very latest on eating to fight disease. Although there are many unique plant foods that do not fit into these groups that are every healthy like celery, beets, carrots and spices like tumeric that are anti-inflammatory. The celery, carrots and beets makes a great juiced combination. Also in Fuhrman's information he explains how studies show that eating greens help the inner lining of the artery to resist the formation of plaque. This is important since the first and third leading causes of death are heart attacks and strokes (cardiovascular problems). As far as the best thing for the 2nd leading cause of death, cancer, it appears that the best thing for that is the sunshine hormone or vitamin, vitamin D. That is why its RDA was tripled in December 2010. Also the nuts and seeds provide a very healthy fat that is needed by the body that is not abundant in the other foods.